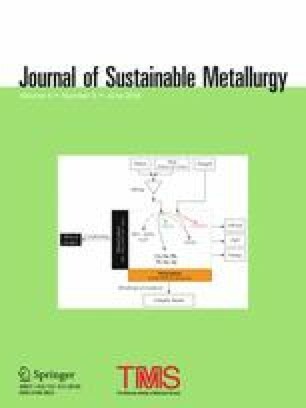 The current study reports optimization of hammer milling parameters to achieve crushed waste printed circuit boards (WPCBs) of − 16 BSS (British Standard Specification) sieve size. The WPCBs, having 22 wt% copper, have been crushed to − 16 BSS sieve size by means of a hammer mill. The result showed that initial milling takes place rapidly and then decreases gradually. Approximately 94% feed material is ground to − 16 BSS sieve size within 7 min, and further increase in the time does not affect the milling rate. It is also revealed that with the increasing feed rate, lower milling rate is experienced due to the distribution of impact energy among more pieces of WPCBs. Study of the size distribution of milled WPCBs (− 16 BSS sieve size) revealed that it follows the similar trend, and the crushed material is mostly concentrated in − 240 BSS and + 72 to − 52 BSS sieve size range. Further, 50–55% crushed fraction attains + 100 BSS sieve size, while the rest is smaller than this sieve size. Chemical analysis of the crushed material of various size fractions elucidated that a fraction above 100 BSS sieve size is copper rich (43 wt%), while − 100 BSS sieve size fraction has lesser copper because the nonmetals which account for majority concentration in WPCBs are milled to a finer size. Microscopic examinations of crushed fraction showed that copper has metallic luster and ruptured foil-type morphology. The fibrous structure of glass fiber and gray/black-colored polygon morphology of nonmetals were also visible. The online version of this article ( https://doi.org/10.1007/s40831-018-0179-z) contains supplementary material, which is available to authorized users. The authors express their deep regards to Head, Department of Metallurgical Engineering, Indian Institute of Technology (Banaras Hindu University), Varanasi, India for providing the needful experimental and analytical facilities to carry out this research work.